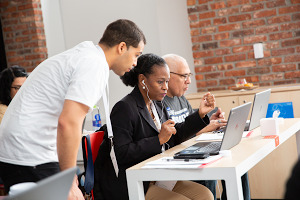 Last year, we announced the Google Developer Scholarship Challenge in partnership with Udacity, as part of Grow with Google’s commitment to help people find a job or grow their business. Since then we've awarded more than 60,000 scholarships to aspiring coders in Europe, enabling them to develop expertise in mobile and web development. And in April, we selected 6,000 of the Challenge program's top performers to receive scholarships for a six-month Nanodegree hosted by Udacity. Abbie Turner, 22, is one of these talented individuals, who will complete her Android Developer Nanodegree this summer. Abbie is a full-time undergraduate student at Sheffield Hallam University and will soon enter the final year of her software engineering degree. 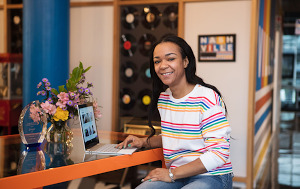 We caught up with her to find out how she's been getting on, and how the Google and Udacity Nanodegree has helped her land an internship placement with a local software business. I'm a quiet person but I love to socialize with my friends and family. I have a pet chihuahua called Blue, I'm a Disney fanatic, and I love Marvel movies and the BBC's “Sherlock” series. I absolutely love technology. I'm the only woman on my software engineering course at university, so it's just me and 300 boys. When I was 16, I had a week's work placement at a software company. I got to meet all the software engineers because we all shared a big open plan office. That was when I first had the idea of going into software. I've completed the first two years of my software engineering degree and just finished an internship with a Sheffield-based audio systems company called Cloud Electronics. What impact has the Google Scholarship had on you professionally? I got accepted into the Nanodegree program just before applying for my internship at Cloud Electronics. I included the Nanodegree on my CV, and it turns out that’s why I was selected for the placement. For my internship, Cloud Electronics asked me to develop an Android app for its sound systems, to control the volume and playlists across different speakers from a mobile. It was quite daunting! The Android world changes so fast, but the Udacity courses are up-to-date and intuitively structured so I always knew where to look when I needed information or advice from a mentor. This made it much less stressful building the app for work and finding solutions to problems. How did you manage to fit the Nanodegree in alongside studying and working? I completed the Nanodegree while working at my year-long placement. I worked 9 a.m. to 5 p.m. in their offices but dipped in and out of the Nanodegree course to learn what I needed to as I built the app for my internship. Effectively, I was being trained on the job by Google and Udacity. There are software engineers at Cloud Electronics, but the mobile app skills I was learning were new to the team. So it provided my employer with an opportunity too. What has it been like connecting with other Google/Udacity scholars? Being a woman in software engineering can be a bit lonely, but the Google and Udacity scholarship program provides a massive community. Being able to talk to other women who share my interests has been really great. We chat via a Slack channel all the time. A few of us in the scholarship group recently organized a T-shirt competition. Everyone wanted the Google Udacity T-shirts that the engineers wear. So we set up a competition for Google scholars to submit their own designs and voted for our favorites. People can buy them, and all the money goes to charity. More than 350 T-shirts have been sold, and we've donated nearly $300 to We Care Africa, a charity promoting access to education for children in Africa. Google has given us this scholarship—this amazing opportunity—so we wanted to give something back. What are your plans once you've finished studying? Once I've finished my degree I want to get a job as a mobile developer in Sheffield. There are loads of developer jobs in Sheffield, Leeds and the surrounding area. Everyone has smartphones nowadays and, if you ask me, Android is where it's at!